Don't attempt to change a flat on a grassy or muddy surface. Make sure you car is parked on asphalt or similarly sturdy ground. Set your parking brake and turn off the engine before slightly loosening the lug nuts on the flat. Raise your car on the jack and loosen the lug nuts the rest of the way. 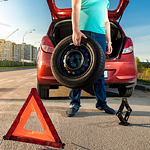 Replace the flat with your spare and hand-tighten the lug nuts before lowering the jack. Tighten the lug nuts the rest of the way using the pattern recommended by your owner's manual. If you've experienced a flat, bring your vehicle to The Sharpe Collection, where we'll replace it with a new one and have you back on the road as soon as possible.